The main screen gives you information about your device's bearings. It allows you to stay level or measure inclinations via a set of gauges that appear on the camera preview as an overlay. To open the main menu, touch the setting icon at the bottom right of the screent, or press the "Menu" button on your phone. Toggle between picture and video mode. This button will be unavailable when a video is being recorded. Like the trigger button, it doesnt not appear on pictures. Your GPS location and its accuracy. Once a GPS fix is established it will display the current location and you can customise they way it appears (Main Menu > Set > GPS Format). Take a picture or start/stop video recording. Provides visual feedback when triggered. Green indicates that a picture is being taken or processed and red indicates that a video is being recorded. Your device's inclination in degrees relative to an horizontal axis perpendicular to your view. This is often referred to as "roll". 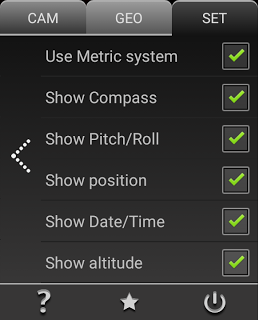 It tells you how far is your phone from a horizontal line. Helps you stay level. When it is green, you are good. The more you move away from the centre point, the more it will become red. It also shows you pitch, roll and heading in degree or percentage values. This also contains an altimeter and date/time. Your device's inclination in degrees relative to an horizontal axis parallel to your view. This is often referred to as "pitch" and tells you if you are looking up or down. Opens the geocam gallery where you can view and manage pictures and videos. Note that pictures and videos are loaded on the first startup, subsequent openings are faster. Your orientation relative to earth's geographic north. You can choose the unit between degrees or mils. If the reading is unstable, your compass needs calibration. Try waving your phone horizontally in a 8-shaped movement, If you do not know how to do this, this youtube video explains it perfectly.. Opens the Geocam settings side menu. Access all settings including camera, geographic tools and app general settings. You can select which cursors to display on the screen (they will also be the ones written on pictures you take). For this, visit the "Set" menu, and the "Display" submenu. 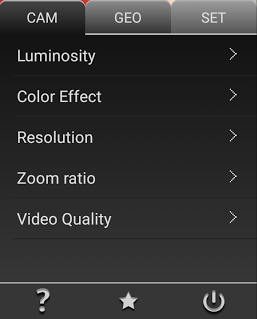 Access all camera settings (see Pictures for details). Note that the Video Quality item is only available on the Pro version which allows recording videos. Access Geocam Maps, manage your markers, export KMZ files to open in Google Maps and use the measurement features of Geocam. Explore the rich customisation features of Geocam. Change display style and content, and choose your favourites unit settings. no GPS information available yet. Geocam is trying to connect to satellites. If a position is displayed, this is your last know location. You cannot add markers at your current location, and GPS data will not be added to pictures and videos. Also you cannot use the "Distance" triangulation feature. GPS information is available, but the accuracy is very poor. You cannot use the "Distance" triangulation feature neither add markers to your current location. Medium accuracy (>10m/33ft). 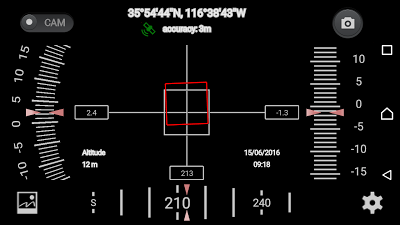 You cannot use the "Distance" triangulation feature neither add markers to your current location.